Canadian Who’s Who is a time-honoured reference work which, year after year, continues to inspire and educate those who consult it. Since 1910, editors have selected the country’s most noteworthy citizens, researching and presenting the details of their lives and careers for the admiration and edification of all. We invite you to explore and discover the Top 10,000 remarkable individuals who continue to shape our nation, including 2,000 educators, 1,000 executives, 800 writers, 700 lawyers, 400 politicians, and hundreds of artists, actors, musicians, athletes, and scientists. While editors do make selections and edit entries to a standard, the biographies truly belong to the people listed, and reflect what they, themselves, consider to be important in their lives. Biographees are given an opportunity to update their entries through direct communication, ensuring that their voices continue to be heard. Every year thousands of biographees updated their records online, by e-mail, regular mail, fax and phone. Editors also invite prominent, as-yet unlisted individuals to complete questionnaires from which new biographies are created. Further, editors regularly consult reliable sources of information presented by government, business, academia, associations, and reputable media outlets, in order to update existing biographies or to create new ones. While we strive for accuracy and currency of the biographies published in Canadian Who’s Who, it is inevitable that this evolving reflection of Canadian life, however carefully compiled, will contain some outdated information. Grey House welcomes comments from readers and biographees providing not only updated content, but also suggestions for how we might improve future editions. 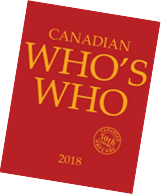 We are committed to continuing the traditional print publication, as well as enhancing the invaluable electronic content found on both Canadian Who’s Who Online and Canada’s Information Resource Centre (CIRC). We are profoundly grateful for the opportunity to share the accomplishments of the Canadians contained herein. Whether you are a serious researcher or casual reader, we hope you will find this information to be as fascinating and enlightening as ever before. 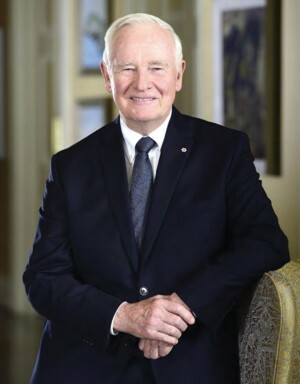 In my role as governor general, I often have the pleasure of recognizing and honouring individuals who have demonstrated excellence, bravery or dedication. With our upcoming sesquicentennial, 2017 promises to be an exciting year on a number of fronts, giving us unique opportunities to celebrate our history, heritage and vision for the future. We will learn more about the men and women who imagined the dream that would one day become Canada and those who have helped to build the great nation that we have indeed become. Not surprisingly, many of those individuals are profiled in the pages before you. We can be proud of the spirit of creativity that abounds in this country, and I am delighted that, for over a century, a reference like Canadian Who’s Who has been documenting the remarkable achievements of the illustrious Canadians represented between its covers. The information that has been compiled is priceless, inspiring young and old, here at home and beyond our borders, and shining a spotlight on the smarter, more caring nation to which we aspire. The Times Publishing Company of London, England first published Canadian Who’s Who in 1910. After acquiring copyright from The Times in 1932, A.L. Tunnell published a second edition in 1936, which incorporated two editions of Canadian Men and Women of the Time, a parallel reference work. From the 1936 edition to the 1975 edition, A.L. Tunnell continued to publish Canadian Who’s Who. A.L. Tunnell usually issued Canadian Who’s Who triennially, with the exception of the years during World War II, although five supplementary booklets (the Who’s Who Biographical Service) were published at intervals between editions of the main volume. After University of Toronto Press acquired publication rights in 1978, it issued Canadian Who’s Whoannually. While Canadian Who’s Who 1979 was cumulative for the years 1976–79, the 1980 edition was the first to cover a one-year period. In 1985 University of Toronto Press published a companion work, Canadian Who’s Who Index 1898–1984, compiled by Evelyn McMann, which was an index of the entire backlist of Canadian Who’s Who volumes to that date. Incorporated within this index were the 1898 and 1912 editions of Canadian Men and Women of the Time, edited by Henry J. Morgan. In addition, University of Toronto Press published a microfiche set of backlist volumes under the title Canadian Who’s Who in Microfiche 1898–1975, and Canadian Who’s Who in Microfiche 1979–1988. It also published a CD-ROM version of Canadian Who’s Who from 1997 to 2010. Third Sector Publishing purchased Canadian Who’s Who from University of Toronto Press in March 2011, publishing the 2011, 2012–2013, and 2014–2015 editions, as well as creating the Canadian Who’s Who Online research platform. Starting in 2012, Grey House Publishing Canada held an agreement with Third Sector to provide online access to biographies via Canada’s Information Resource Centre (CIRC). In March 2016, Grey House fully acquired Canadian Who’s Who, both print and online versions. We are very proud to publish the traditional red volume and its accompanying web resources. Accessible via Canadian Who’s Who Online and CIRC, the online content provides access to 24,000 biographies – those currently in the print edition and those that have been archived since 1999.